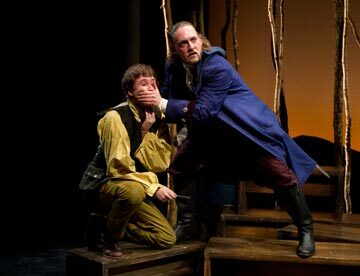 People’s Light & Theatre presents Kidnapped!, an adaptation of the Robert Louis Stevenson novel, by Ernie Joselovitz, which runs on the Steinbright Stage January 13 – February 6, 2011. Resident Director Samantha Bellomo directs. From beloved author Robert Louis Stevenson, Kidnapped! is a story of adventure that takes us from the high seas to the Highlands of Scotland. Young David Balfour, cheated of his inheritance and sold into slavery by his avaricious uncle, escapes to the Highlands with the aid of Scots freedom fighter Alan Breck. Together the friends prove that courage and the right intentions can defeat cruelty and evil. 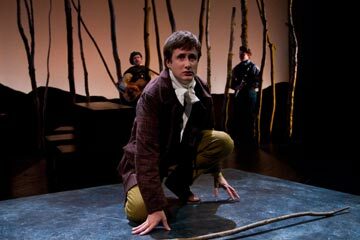 Aubie Merrylees as David Balfour (foreground), Peter DeLaurier as the Troubadour and Matthew Allison as the Musician (background) in KIDNAPPED!, an adaptation of the Robert Louis Stevenson novel, by Ernie Joselovitz, at People’s Light & Theatre. The set, inspired by the art of Andrew Goldsworthy, will be elemental and bare so that it can feel as vast as the Highlands. Music will be used to underscore the movement; flautist Matthew Allison will be on the stage and incorporated into the events of the play. Kidnapped! starts Thursday, January 13th at 7pm and runs through Sunday, February 6th. Audiences are encouraged to join the artists after each performance to discuss the production. Single tickets are $31 for adults and $20 for children. For tickets, call the box office at 610.644.3500. Special discounts, meal packages, and talkbacks with the artists are available for groups of 10 or more. For more information or to purchase group tickets, call 610.647.1900 x134 or email group@peopleslight.org. Actors, prices, performances dates and times are subject to change. Additional service charges may apply. TARGET Access Night is Thursday, January 20th at 7pm and all tickets are half-price. Call the box office or visit us online at PeoplesLight.org and use the promo code TARGET. Subscriptions to the TARGET Family Discovery Series are still available. Subscriptions for youth ages 17 and under are $30 or $36. The subscription includes Kidnapped! (January 13 – February 6, 2011) and Mark Twain’s The Adventures of Tom Sawyer (February 17 – March 13, 2011). « Giveaway: Win a $100 Gift Certificate to Wayne’s White Dog Cafe!